Beautifully printed postcard designed and published by M.F. Berkey, Santa Barbara, California in about 1910. 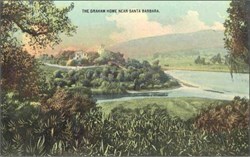 This beautiful postcard has an image of the Graham Home Near Santa Barbara and is over 90 years old.